Simple – Add one scoop to water or your choice of milk, shake, and immediately feed your body what it needs. Healthy – A fusion of protein, fruits, vegetables, antioxidants, probiotics, natural herbs, greens and liver nutrients that propel you to better liver, heart, digestion and overall health. 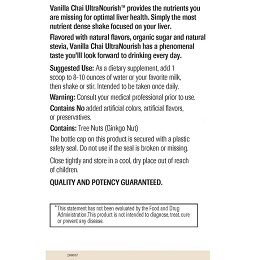 Delicious – Flavored with natural creamy vanilla and natural spiced chai flavors, organic sugar and natural stevia, Vanilla Chai UltraNourish has a phenomenal taste you'll look forward to drinking every day. 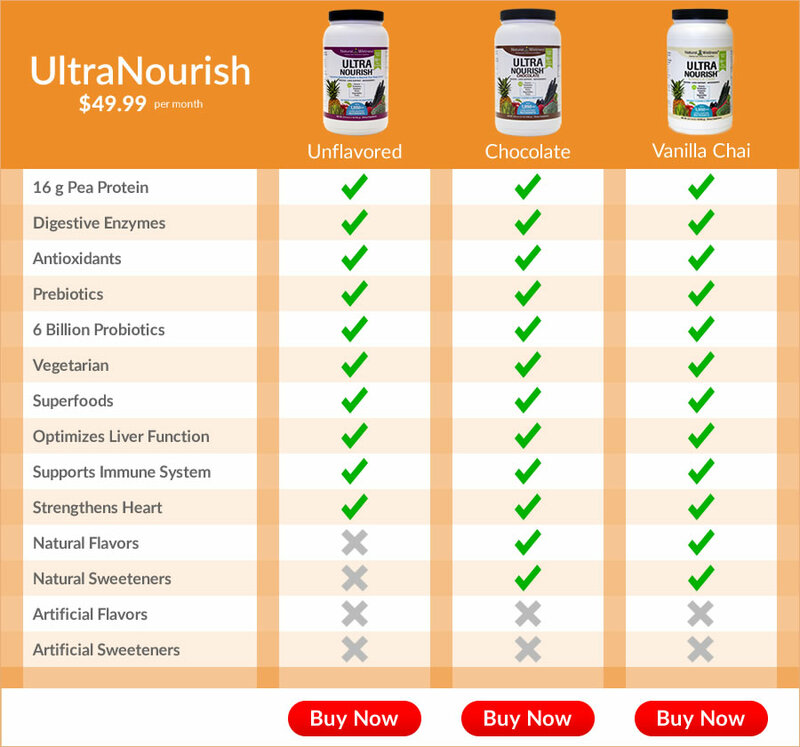 Vanilla Chai UltraNourish is so tasty you won't even remember that it contains protein, antioxidants, prebiotics, probiotics, greens, fruits and natural herbs, but your body will thank you. 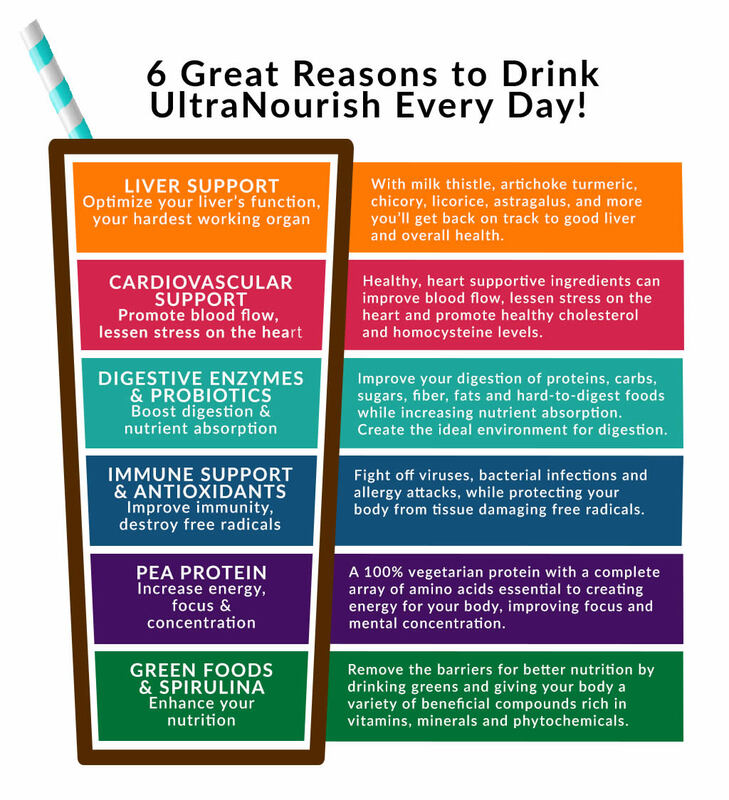 UltraNourish, with its 1,950 mg Liver Support Blend, is the ONLY superfood, protein shake that ALSO FOCUSES ON YOUR LIVER. It's truly the ONLY TOTAL BODY superfood, protein solution on the planet. Why Focus on Your Liver? Your liver is your body's filter and cleaning system. In fact, you rely on your liver for more than 500 essential functions. And if it is not working correctly, it NEGATIVELY impacts your digestion, immunity, and blood sugar levels – just to name a few. When it's not functioning properly, your liver struggles to remove toxins you naturally absorb through the environment and everything you ingest. Your digestion suffers. You stop absorbing all the nutrients from your food. You have a tough time breaking down fats and cholesterol and removing them from your body. This puts your body, your heart, and your immune system at risk. Your blood sugar levels fluctuate. Your liver cannot convert the correct amount of glycogen into glucose and release it into the bloodstream to normalize blood sugar levels. In other words, all your vital systems – in fact, your total body health – depends on the health of your liver. Just like a filter, it can only take so much before it gets sluggish and doesn't work as effectively as it should. 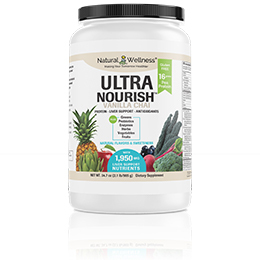 That's why UltraNourish includes a specially designed liver supportive blend in addition to all the protein, fruits, vegetables, antioxidants, and probiotics you need for total body health. With 1,950 mg of proven liver beneficial ingredients – including milk thistle, artichoke, turmeric and chicory – UltraNourish regenerates, protects, and improves your liver function. 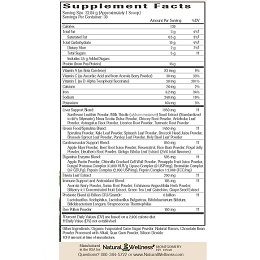 Our Unflavored UltraNourish was intentionally created without any sweeteners and flavors. We developed it this way so you could have the freedom to create your personalized shake, using any juices, milk, fruits, greens and nut butters YOU preferred. But what about those days when you don't have extra time to create a personalized shake? Using natural flavors, stevia and organic cane sugar, Vanilla Chai UltraNourish is a delicious alternative for those wanting to simplify their shake-making routine. Just add water or milk, shake it up, and you have a delightfully healthy shake ready in seconds! Like we said, now you have more options. 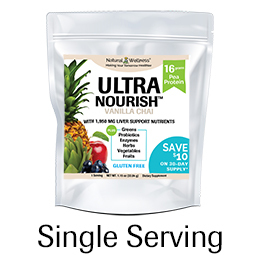 Mix up an Unflavored UltraNourish shake when you have time to prepare ingredients for a customized shake – or simply add a scoop of mouthwatering, Vanilla Chai or Chocolate UltraNourish to water or milk. Either way, you're nourishing your liver and your entire body! UltraNourish contains the highest-grade and most potent ingredients available in their proper quantities to do you the most good. No expense has been spared in bringing you these two total body solutions. If it's in UltraNourish, it's in there for a reason. 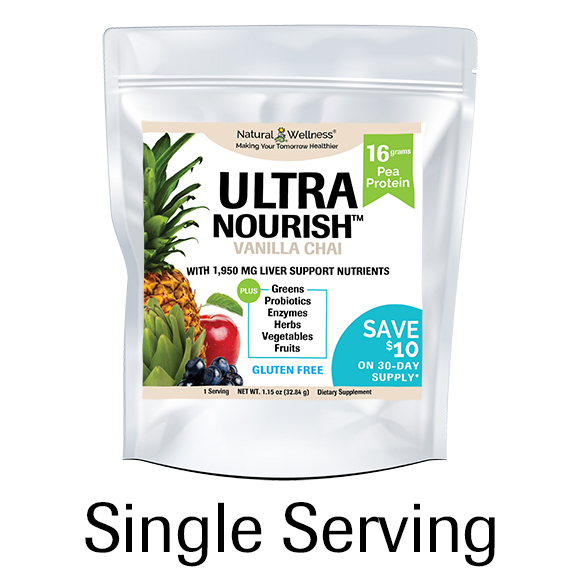 With UltraNourish, you'll get the liver protection plus the fruits, vegetables, protein, antioxidants, probiotics and more that are missing from your daily diet, all in the proper amounts necessary to maximize your total health. Plus it's 100% vegetarian and gluten free. 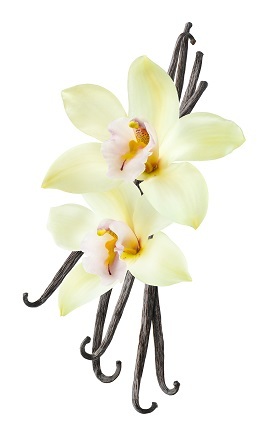 Mix, shake or blend Vanilla Chai UltraNourish with water or your favorite milk. For a different spin, try adding fruit, greens, superfoods, boosters, spices, ice, and more to make smoothies that are as unique, delicious, and super swanky as you are. Intended to be taken once daily. 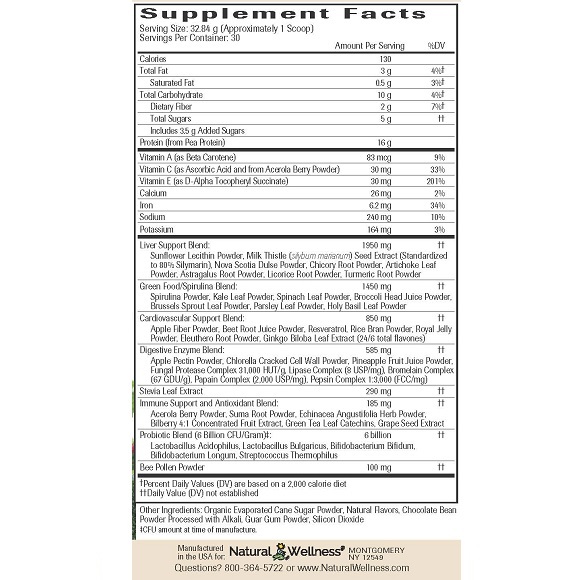 If you are allergic to pineapple, latex, wheat, celery, papain, carrot, fennel, cypress pollen, or grass pollen, you might have an allergic reaction to bromelain which is contained in this product. 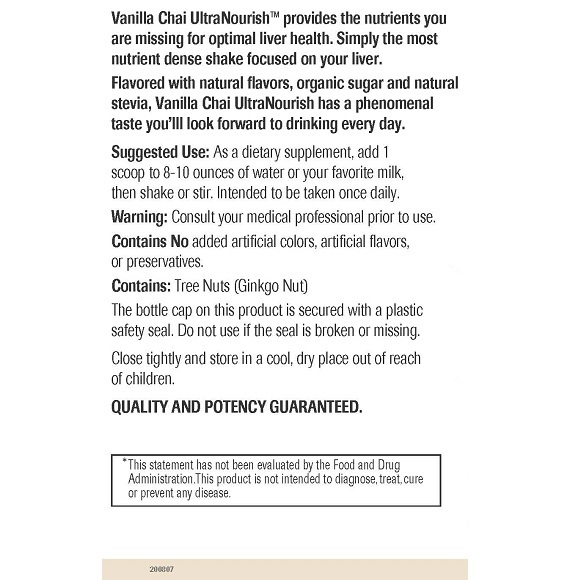 Vanilla Chai UltraNourish is MANUFACTURED in the USA to meet FDA strict current Good Manufacturing Practice regulations (cGMP).